What lessons can we learn from Schwarzenegger, Shriver? I don’t usually comment on celebrity marriages and breakups unless I feel there is a broader lesson that I can learn from the situation. 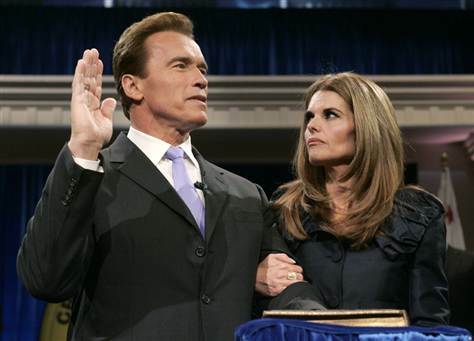 In the case of Maria Shriver and Arnold Schwarzenegger, there are clear lessons, even if we don’t know the details of their marriage. The first lesson is that even if we love our spouses, as they profess to love one another, we can’t take for granted that we will be married happily ever after, even after 25 years. We still have to put the time in together and make the daily effort to keep our lives connected emotionally and physically. Their high-profile jobs as California governor and news journalist kept them separated and overcommitted. Although Shriver stepped away from her journalism work, she has remained very active in advocacy work. Being in the public eye and having many public and private responsibilities adds to their time commitments away from one another. This serves as a reminder that we can’t take a strong marriage for granted. We invest and grow, or we deteriorate. There is no maintaining the “status quo.” We may think we are staying still, but we are drifting due to the winds of change and the waves of life. Before we realize it, we’ve become separated and we’re not even sure where the other person is. Don’t take that risk. The second lesson is that major life stresses and transitions will almost certainly affect the marriage. They have both experienced major upheaval, from recent death of Shriver’s father (with whom she was close) to the changes in both of their careers, including Schwarzenegger leaving his role as governor to return to the big screen. (I guess we should have believed him when he said in his famous accent, “I’ll be back.”) Shriver is trying to find her way personally and professionally, and trying to determine her next professional step. In addition, they are busily raising four children, and we all understand the time commitment and stress that can involve. “Major life transitions, especially career transitions, are stressful, and that stress often bleeds into the marriage, said Branford Wilcox, director of the National Marriage Project at the University of Virginia. There’s even a risk to overreact during such transitions. I believe it’s wise that the couple is holding off on a divorce at this time, because making such enormous decisions during a time of great upheaval can be very emotional and cause future regrets. Experts say the end of a career can also become a time to reassess relationships and personal goals. Women may try to “find themselves”, and men may be looking for new experiences. The article “Career change can do a number on many relationships” offers many possibilities of how couples handle transitions. I would suggest it if you are nearing retirement, or if one of you is experiencing career transition. A broader lesson is to try not to make major marital decisions during a great transition in your life, such as the death of a loved one or a career change or even a relocation. Career changes can be a blow to our ego, which affects how we relate to one another. Grief and sadness can also cloud our decisions. Even a relocation during which we may not be surrounded by an adequate social network can magnify marital problems. A pro-marriage counselor may be needed to help a couple move through difficult life transitions. I’m hopeful not only for Shriver and Schwarzenegger, but also for their four children, aged 21, 19, 17, and 13, that they can keep their family together, because divorce has been shown to devastate even older children. Slattery explains that for older children who experience a family divorce, “It doesn’t lesson the impact at all,” explaining that the pre-teen, teen and even young adult years are some of the worst times for children to experience a family fracture. Their worldview is forever changed. It’s a mistake to believe children are resilient and will simply bounce back from such an event. If you’re interested in research about children of divorce, I would recommend Between Two Worlds by Elizabeth Marquardt, or simply talk to someone you know whose parents divorced when they were children. What lessons do you see in this or similar situations where a long-term marriage that has previously been happy begins to unravel? This entry was posted in Books, Communication, Divorce, Family, Happiness, Love, Marriage, Relationships and tagged Family, improve marriage, lessons on marriage, Love, Maria Shriver, marital separation, Marriage, preventing divorce, saving marriage, Schwarzenegger. Bookmark the permalink. Thank you for your thoughtful commentary. I live in SoCal and gossip about the separation and lots of speculation are all over “news”… it’s sad and divisive. Marriage is a partnership and it’s complicated.